Am I all a-flutter about the new episode of Lost? Yep, you betcha. Beth and I have become fans even though (you might know) that most evenings I’d rather be reading, maybe even something like Puritan theology, social ethics, or some heart-breaking memoir. Beth continues to read novels, research Lyme disease, and generally avoids most of the pop stuff on TV. (Our daughter insists that we are the only family she knows who doesn’t have cable. Shoot, I know families who don’t have a TV!) But then we discovered Lost a few years ago on DVD and we’ve been loving it ever since. I’m so hooked. And all those book references? The philosophical names? The Biblical allusions? I’m not going to lie: we love it. So, The Gospel According to Lost (recently published by Thomas Nelson; $14.99) is the latest by Chris Seay, a pastor in Texas who serves a church gathering called Ecclesia. He’s done The Gospel According to the Sopranos, a pretty cool book on The Matrix films (The Gospel Reloaded) and a brilliant book interviewing crooks from the Enron scandal, asking how it could be that people raised in a Southern fundamentalist culture could go to work and cook the books. Ahhh, that old sacred-secular dualism, that compartmentalization, that failure to connect the dots between Sunday and Monday, between prayer and politics, between work and worship. Well, our man Seay, who will be on the main stage at the CCOs Jubilee conference in Pittsburgh in a few weeks (it is not too late to sign up! ), is a master of seeing God’s truths in popular culture, in exegeting the images of our times even as he exegetes the Bible. He is wild about Lost, has a real passion for the show, and does some interesting ruminating about the meaning of it all as he dedicates a chapter to each main character. And I mean he is exploring the Meaning Of It All, as only a Lost fan could do. This is a fun and interesting book, and some have said that even if you haven’t watched the show, it is a great way to generate faith-based conversations with those who do watch the show. So, fan or not, this is a great primer, because it allows the deeper questions that so naturally surface in the show to come to the fore. Hurley, Sayid, and the one of Daniel Faraday (“Patron Saint of the Mystic Scientists”) are especially moving to ponder. (Oh, and the one of Iko is powerful, with that weird walking stick with the Bible verses, and the icon of John Locke, while not particularly endearing, is very well done.) But the artwork is the icing on the cake: the great part of this book is how the author explores an essential theme in each character, developing insights, perplexities, joys and sorrows of each, and honors the artistry of the show on its own terms. And then, wisely, slyly, even, he shifts from some arcane detail of episode such and such, or some scholarly footnote about a name or book that appears in the show, and he’s off, hipster preacher that he is, talking about eternal things, offering a distinctively Christian perspective on the issues of the episode. There is no doubt in my mind that Seay is not just “using” the popular arts for his own purposes, he is deeply engaging it, as one who appreciates and enjoys it, and he does so as a follower of The Christ. His reflections end up being intregal, not somehow exploiting the show, but woven together, most often nearly seamlessly. Seay cares about the characters, and he obviously gets a kick out of the communal nature of the Oceanic buzz, the speculations, the blogs and water-cooler conversations, even the pop songs that have emerged from the show, the that song by The Fray. It has been a while since a show has generated wide-spread conversations about faith and reason, about social philosophers like John Locke, or the nature of God’s providence in matters of good and evil. That this is a cool show, an intelligent show, a show with some overtly Christian content (despite some very troubling matters, from violence to gnosticism, to paganism) and a show that has drawn in a large part of our nation can’t be denied. That a joyful Christian leader would engage it with such verve and true insight is a blessing to behold. There may some day be a more definitive Lost text. For now, we are so happy to be able to tell you about this. And very excited that we’ll get to meet Chris at Jubilee 2010. 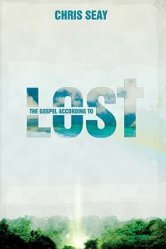 Check out The Gospel According to Lost by Chris Seay. Then, if you’re up for it, consider Lost and Philosophy:The Island Has Its Reasons edited by Sharon Kay (as part of the Blackwell Philosophy and Pop Culture Series) which is a fully serious collection of contemporary philosophy buffs doing serious cultural studies work, using Lost as a springboard for some very deep speculations. I couldn’t resist showing this picture from Chris Seay’s twitter post today, showing Kate all dressed up at the Hawaii parties this week, with The Gospel According to Lost in her hands. How cool is that? She is, by the way, known as a person of faith, a star who spends her off time in refugee camps in Africa. From what I hear, she’s the real deal. And she’s happy to have the book. You will be too, even if you aren’t wearing an evening gown when you order it. We can mail it out right away. Thanks for ordering through us. I love this book by Chris.